Hello ... Hello ... my old friends ... It's great to see you once again! Being an avid collector of ELO vinyl and their many releases on the Jet label in the decade following 1975 can occasionally offer up the odd quirk. 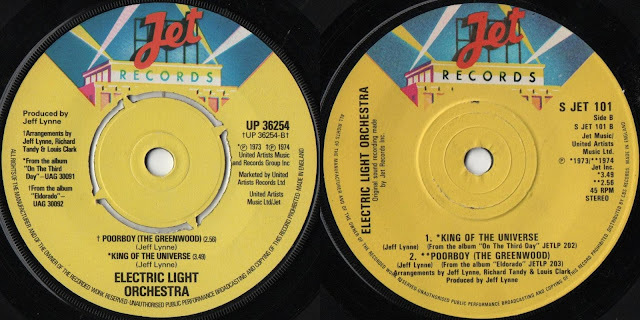 Back in May 1978 after having ditched United Artists [UA] for CBS as their distributor, Jet Records reissued five singles by ELO & Jeff Lynne, namely "Rockaria!" [SJET100], "Telephone Line" [SJET101], "Doin' That Crazy Thing" [SJET102], "Turn To Stone" [SJET103][presumed as withdrawn at the time of writing] and "Mr. Blue Sky" [SJET104]. One thing that stands out in my memory, being an ELO completist at the time, was the error found on the 'B' side of the "Telephone Line" re-issue. The originally released single [UP36254] was backed by two tracks from the then Jet/UA re-released "On The Third Day" and "Eldorado" albums [released on Warner Bros. first time around] in "Poorboy [The Greenwood]" and "King Of The Universe". However, the Jet/CBS re-issue [SJET101] listed the tracks in reverse even though the physical tracks were in the same order. Jon Lock, the man behind the ultimate ELO collection web site ELO Light Years Ahead [ELOLYA], reminded Yours Truly KJS that a sticker was attached to the 7" back in the day to 'warn' buyers of the mistake but that it is unlikely that many survive intact to the present day. A further minor spelling flaw can be found on the "Mr. Blue Sky" re-issue [SJET104] too. But can you spot it?